The worlds leading glass container manufacturer, has for well over half a century produced high quality, sustainable, brand-building glass packaging. It has created such glassware for many of the worlds best known food and beverage brands; Brands producing beer, wine, spirits, food, non-alcoholic beverages, cosmetics and pharmaceuticals for public sale and consumption. The company also produces a high value range of tableware and stemware for domestic usage. As the world’s leading glass-packaging maker, we create beautiful, recyclable glass containers for many of the best-loved brands. Here’s a snapshot of the global influence of our company. In late 2015 the company was looking to substantially increase its investment and development of Data Analytics. The company were seeking a corporate partner to guide and assist them in the very specialised area of Data Analytics after internally conducting a small pilot exercise. The company recognised its Data was disparate and isolated in various business systems across its Asia Pacific operation – ERP (SAP), Custom designed in-house manufacturing systems, Health and Safety Systems, A financial planning global system, Human Resources, Supply Chain Systems and many more were all being utilised – separately. The pressing need was to provide a regional view to support management with a dashboard application accessible through mobile and supporting desktop dashboards. In addition the company also was looking to select a solution to undertake “Proof of Concept” to then analyse the inspection machine data (sensor data) and to understand the variability in the performance of glass container inspection stations on production lines. 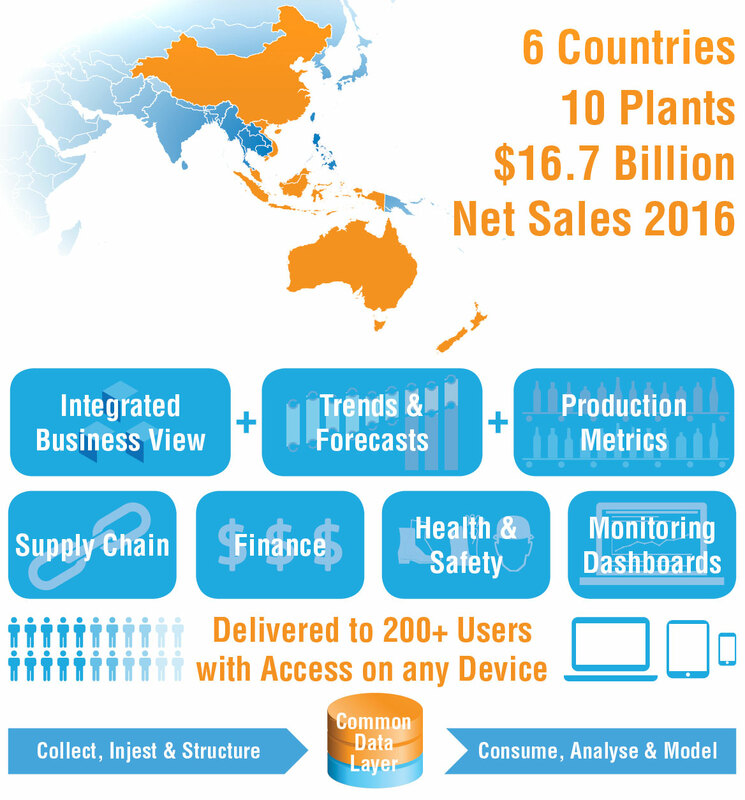 Australia, New Zealand, Indonesia, Malaysia, China & Vietnam with 10 manufacturing plants in the Region. The project team leveraged AGILE (Iterative) delivery approach with incremental delivery of data and business capability. Access via the Infonyx Smart Data Cloud Platform enables mobility i.e. access ANYTIME, ANYWHERE. 200+ users across the region can access dashboards and generate insights. Initial solution delivered on premises then migrated to the Infonyx Cloud platform. Sensor Data (streaming) was ingested in the Infonyx pre-architected cloud into Hadoop and with a model developed and delivered using “R” to compare the performance of each of the glass container inspection stations to understand the variability of the inspection process with a goal to identify any outliers impacting the quality of inspections. We provide advisory consulting to help define the reference big data architecture for the company. Barwon Health is one of Australia’s largest and most comprehensive regional health providers. Health services available cover the full spectrum from primary care through to acute care. Community care is provided via. A Major Teaching Hospital and associated services, staff of over 6000. One of Australia’s largest regional employers and a major education provider in combination with Deakin University. Barwon Health has been implementing an enterprise datawarehouse and reporting solution to support their enterprise business reporting and data needs. With a need to further extend the business capability Barwon was looking to engage a service provider to assess the readiness of their current solution and provide high level recommendations to execute their vision supported by a roadmap, next steps across architecture, self-service, infrastructure and business data needs. Infonyx was engaged by Barwon Business and project teams to assess the existing end to end data analytics landscape as well as current and future business needs. An assessment was undertaken by organising meetings with infrastructure, business and delivery teams to understand the current environment and identify potential gaps for consideration. Existing documentation was reviewed and assessment findings were documented in the end report with proposed next steps and quick wins as a final deliverable. The SALHN comprises the Flinders Medical Centre, the Noarlunga Hospital and the Repatriation General Hospital. The SALHN Network is a partner with Flinders University. The Network provides care for around 350,000 people living in Southern Metropolitan Adelaide as well as providing Statewide Regional Services. Medical Trainees are engaged at and rotate through all three sites. Southern Adelaide Local Health Network (SALHN) had a pressing need to access data at patient level to support the day to day operational needs of the hospital across Inpatient, Emergency and Elective Surgery Waitlists. 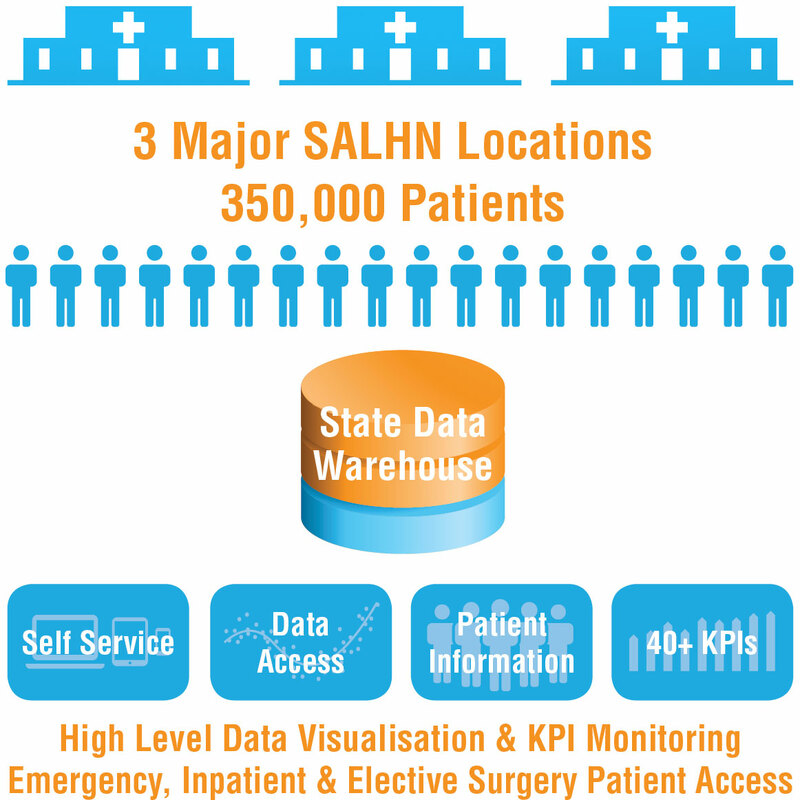 The data was central in the state datawarehouse and SALHN was looking to engage a service provider to assess the feasibility of accessing the data followed by delivery of dashboards for the use by their data team. Phase 1: Assessment and delivery of a feasibility report with high level data visualisation implementation architecture and recommendations. 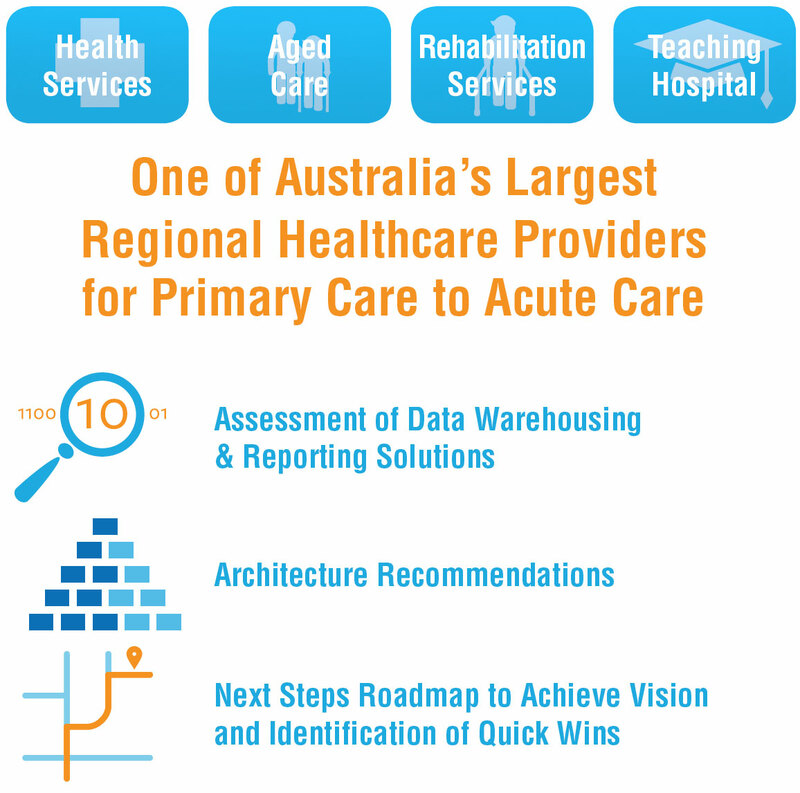 Phase 2: Commission the data visualisation environment (Tableau) with delivery of 40+ KPI’s with access to data for self service across Emergency, Inpatient and Elective Surgery in a onshore offshore delivery model.